It’s a new year and I’m in the market for some new bras. As I have mentioned before, I have pretty pendulous breasts. Rather than go for what’s on sale, or what looks nice, I decided to go for bras that are purposefully designed to support breasts like my own. The name of the game when it comes to pendulous breasts is support, so the first style of bra I will be looking at is the cut and sew bra. Cut and sew bras are an excellent option for women with pendulous breasts because they offer a lot of different styling. You can find cut and sew balcony bras, plunges, and all sorts of other beautiful options. How to identify a cut and sew bra? Look for a bra that has cups made from strips of fabric that have been cut and sewn together. 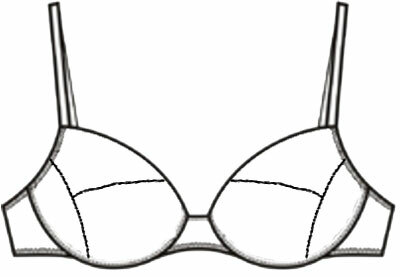 You can find cut and sew bras that have only one seam (two strips of fabric per cup), or ones that have three. One of my first and favorite bras I purchased after being properly sized, the Freya Rio bra, is a great example of this style. The most supportive cut and sew style bra is one with a T-shaped seam, a horizontal seam across the center of the cup that meets with a vertical seam that splits the underside of the cup in two (the first of the three pics above). Why is this style a good option? There are two reasons why I like this style of cup. The first is that because these bras are made up of multiple pieces of fabric, they are more able than other types to conform to your breast shape. This means you won’t have issues like awkward gaps between your chest and your bra. If you’ve ever put on a thick, padded t-shirt bra, you’ve probably experienced this. The second is that because it’s made of fabric and not foam, it’s easy to find options where no bulk is added to your bust. One of the most solid bras I can think of in this category is the Elomi Women’s Caitlyn Underwire Side-Support Bra. It’s been around for a while, but it’s a solid performer and top pick for larger-busted women for a reason. The straps on this bra are made out of leotard. I guess the idea is to make something soft and comfortable and airy. The straps stay in place and don’t slip off the shoulder, but I do find that depending on what length the strap is, the strap sometimes needs to be adjusted during the day because it can slip. The top of the cup features a breathable sheer panel. While this is a nice functional design feature, the pattern on the sheer part of the cup can be seen through some clothes. One thing I cannot fault this bra on is the level of support. The combination of supportive inner slings and a solid underwire provides a lot of needed lift for the girls. I find Elomi gores can stick out easily if you don’t get your fit exactly right. While this bra works for me and doesn’t pop out, be wary of this and check your size carefully with their conversion chart. ot expressly designed for smoothing, it does smooth a bit. While I like this sheer back, I can’t help feeling that this bra would have been more supportive with a stronger material. This bra has some pretty good side support due to side panels that come up quite high and a relatively wide underwire. The result of this is that your breasts are not spread flat. Instead, they are pushed forward, creating a slimming effect. There’s is no mincing words on this part, the underwire runs wide. As with every feature on a bra, what makes it work great for others may be a deterrent for you. If you have a petite frame, you might feel like the underwire goes straight for your armpits and for some, all the way to your back. For me, the underwire ended up under my arm, but I am tall enough that I didn’t feel them poking uncomfortably. 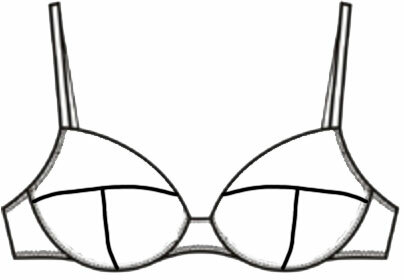 The upside of this of course is that you don’t feel like the cups are too small or that the underwire is restricting/digging into your breasts. This bra feels incredibly supportive and well-made, thanks to its full coverage and solid structure on the underside of the cup. This is definitely a bra that I could run for the bus in. It has a good lift and my breasts don’t spill over in the cup, which I love. Because of the seams, the Caitlyn can show through shirts, but this is an issue with almost all cut and sew type bras. The bra does a good job of separating and defining your breasts, but take note that it will also make you feel a little pointy. Overall, this is not the sexiest bra out there, but it does have a lot of playful colors. By combining good side support with good lift, it helps define your waist better and can have a slimming effect. 4/5.